A good article about that manually-operated elevator (and the cool cat who operates it) can be found here. It was in the magazine publication, Our State. Thanks Andrew - I had seen that article when it came out, but forgotten about it. I know of one other manually-operated elevator in Durham, which I believe is unused now - at Duke Chapel. Back in the day - when I was an undergrad at Duke - there were some very limited times where you could ride the elevator up to the top of the Chapel (the roof of the steeple). It was a cool experience (a great view) and I don't think they do it anymore. Elevator operator was a work-study job for students. I love these pictures because you can see just how vibrant downtown Durham used to be. It's just not like that anymore and it’s always been a down side for me. So many of the cities I’ve been to count on their active downtown communities. I hope that after they finish construction on the roads the people will come back. Hi Sequoya - thanks for stopping by. It is rather amazing, and sad, to see pictures of Main St. and Five Points from the 1940s and 50s - the sidewalks and streets packed. I have one picture that I find amazing, taken in the 1950s, at night - all of the stores on Main St. are lit up - all of their signs and windows. The street is full of people - a solid, packed crowd. Christmas lights drape over the street, and people look excited. While that Durham is gone, I think we could have people on the streets downtown again. But I'm not sure most of the people with the power to chart that path have any idea what they are doing. You mention that it is from "Duke Archives" but I've been unable to find it online. Is it available digially or only physically at the Duke Archives? And do you mean the Archives at Duke or the Duke Documentary Photography Archive? Thanks for your help, and for digging up so many great images. The photograph came from the online collection, in the Parnell papers. It is listed as unidentified, so perhaps that's why it was difficult to locate. The piles in the foreground are, I believe, mail for the post office. If you look for my post on the Nancy Grocery, you'll see a shot taken from the same spot, looking the opposite direction. Glad you like the blog/photos, and much thanks for your compliments. I'm trying to find the article on the Snow Building Elevator. The link to Preservation Durham above doesn't work and I couldn't find it in a search at Our State. Any other ideas? The tiny old elevator was still in operation as of 2010, but no longer available for use by the general public -- towertop aspirants now climb round after round of spiral staircase. About the last time I was in downtown Durham during Christmas was 1967-8 I believe. There were still sidewalks full of people shopping and plenty of stores open. The feeling is indescribable, the lights, people, smells from the stores, it was a happy feeling. I saw people I knew to speak to and everyone seemed happy going about their shopping. I haven't had that feeling since. It's just not the same shopping in a mall, even one like South Pointe trying to fake it. I wish everyone could know how wonderful downtown was. You're doing a great service educating folks on what was here. I hope more people will appreciate it. The Snow Building was one of a 'second wave' of more impressive commercial structures to be built at Five Points. 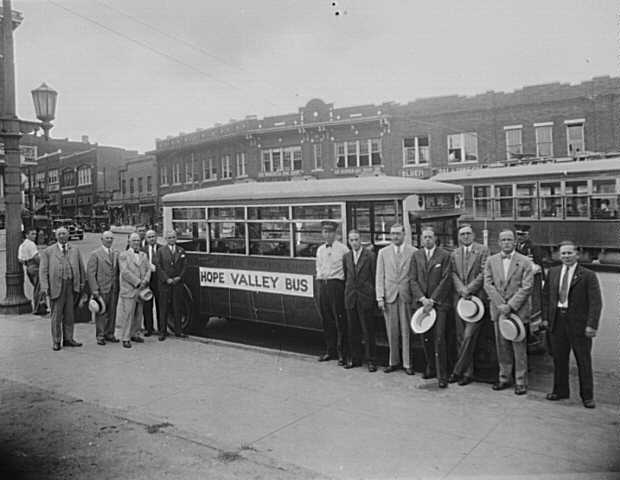 Situated between the core of downtown (Main between Church and Corcoran) and the Duke Factory, the Five Points area initially consisted of more modest, single-story, often frame commercial structures, as well as residences. 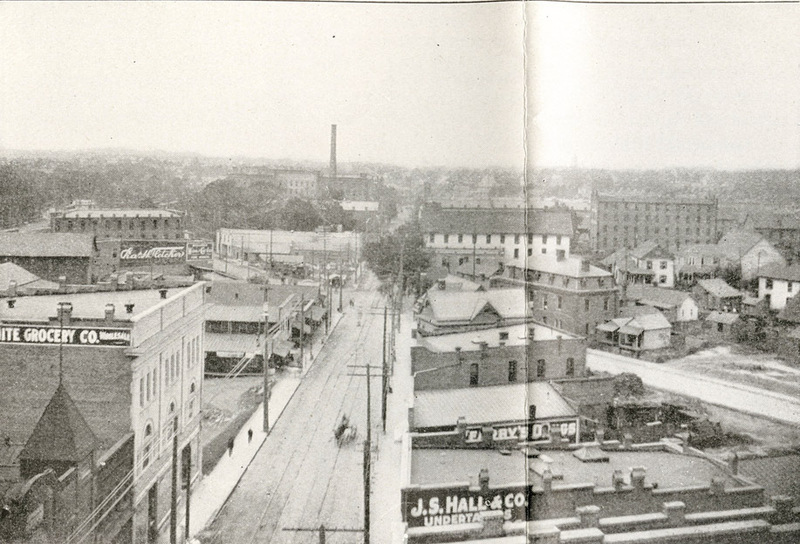 A view west from the Trust Building, 1905 shows Five Points early in transition - the older, modest, single-story structures and residences are beginning to be supplanted by larger buildings, such as the Kronheimer Department Store (the building with "Grocery" on the side) at the left side of the picture. Beginning at the turn of the century and continuing into the 1930s, almost all of these structures were replaced. The Snow Building was one of the last of these 'second wave' structures to be constructed. 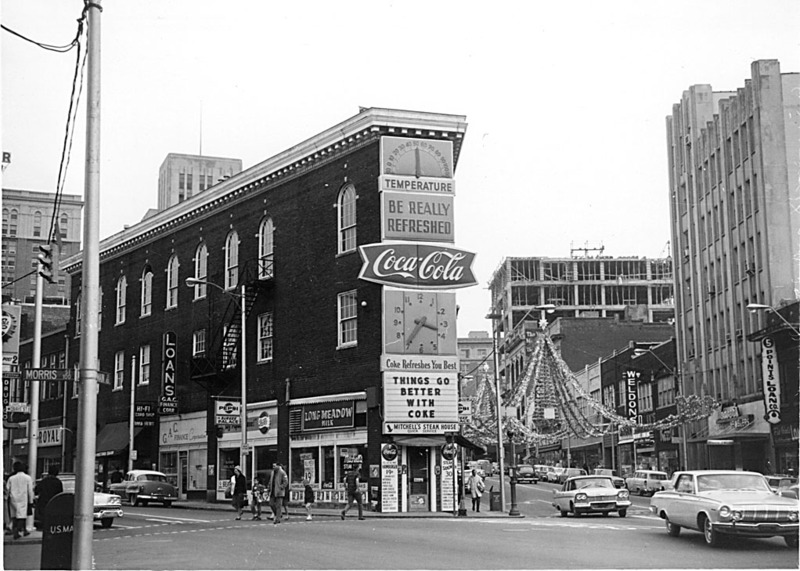 The picture below shows the south side of Five Points, prior to the construction of the Snow Building. The one first-generation commercial structure in the picture - towards the left and set back a bit from the sidewalk with a front overhang/awning - would be replaced with the Snow Building not long after this picture. The Snow Building, one of Durham's two most elaborate Art-Deco buildings (along with the Kress building) was constructed in 1930. George W. Kane was the general contractor. The Snow Building contained multiple offices as well as first floor retail. 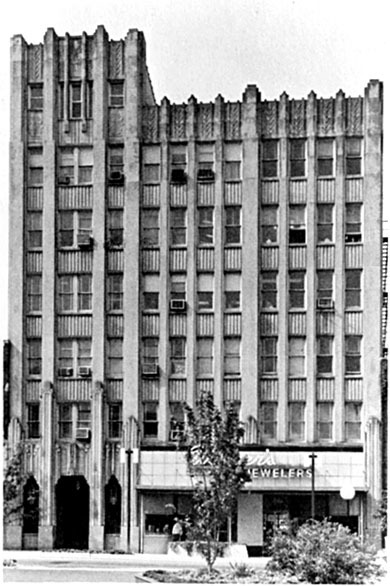 The 1963 shot below shows an oblique angle of the building in relation to Five Points and the Piedmont Building as well as the jewelry store that occupied the first floor retail space. I'm trying to find the article on the Snow Building Elevator.